Look carefully at this painting and describe what you see. Where does the scene take place? Is this a diverse crowd? Where are the figures going? From where have they arrived? What other details reinforce the differences between the people portrayed? List all of the words that appear in this painting. Southbound: Who is headed south? What destinations do they have in the South? Why do you think these people are headed to such places? How do you think they feel about their journey? Trains North: Who do you see approaching the northbound trains? Where are they headed in the North? How do you think they feel about their journey? In this brightly colored painting, people are preparing to board trains headed either south or north. Well-dressed white travelers on the left receive help with their luggage from African American porters dressed in orange. Southbound trains will take these passengers to vacation spots in Florida, as the labels over each door read Miami, West Palm Beach, and Tampa Bay. The African American travelers on the right, however, carry their own luggage and move toward a door marked Chicago (near other doors marked Detroit and New York). The distinction between these two sides of the scene is further emphasized by the architecture of the station, with long halls divided by high walls. 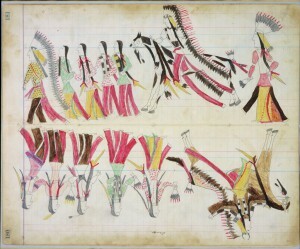 The physical separation of the two groups of passengers shows the racial and class divisions between them at the time this painting was made. Jim Crow laws legalized segregation in the South, which separated people by race in all public spaces, including trains and train stations, had separate, but rarely equal, sections or facilities. In the upper right section of the painting, for example, a woman exits through a designated “colored” doorway, and in the center, a porter directs a confused African American man toward the trains heading to the North. This painting by Walter Ellison captures the massive relocation of African Americans called the Great Migration, when more than six million blacks left their rural southern homes and moved to industrial cities in the North (and later to the West, especially California). The mass emigration be­gan around World War I (1914–1918) and continued through 1970. For many African Americans, this journey toward the land of promise in the North began by train. 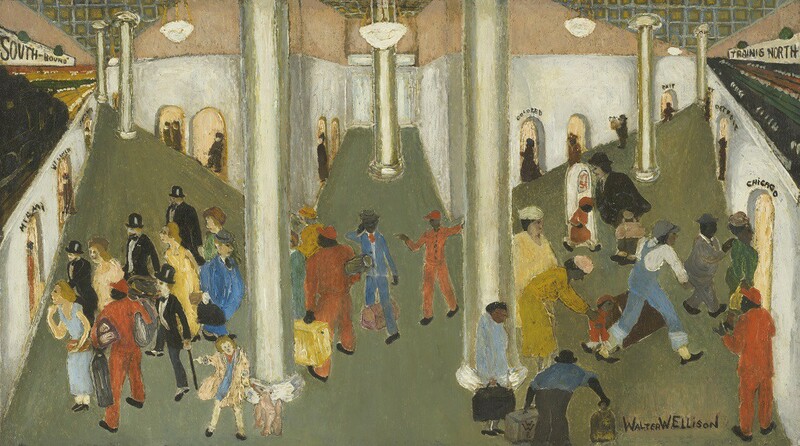 The train station shown in this painting might be the one in Macon, Georgia, from where Ellison, as a teenager, left the South and headed to Chicago. 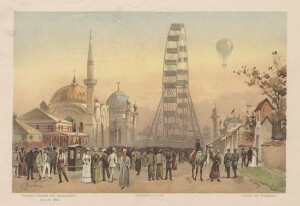 Chicago, the largest industrial center of the nation at the time this painting was created, offered jobs in the meatpacking, rail, and steel industries. For this reason, it attracted the greatest number of migrants (around 60,000) by the end of World War I. Chicago was known to many southerners through The Chicago Defender, an African American newspaper that not only provided information about the North and Chicago, but also spoke out against lynching and other forms of racial oppression in the South and portrayed the North as a place of greater freedom and opportunity. The black population of the city almost doubled two years later, by 1920. Although discrimination existed in Chicago, the city also offered better schools, voting rights, leisure activities, and the chance to live daily life with more freedom than was possible in the South. Ellison probably ended his own journey north at the Illinois Central Railway station, now demolished, at 12th Street and Michigan Avenue. Once in Chicago, he studied at the School of the Art Institute of Chicago, one of few art schools in the country that accepted African American students. Ellison played a pioneering role in the creation of the South Side Community Art Center, which was established in 1940 to both showcase and provide educational opportunities for local black artists. 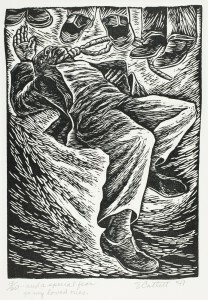 Walter Ellison chose to represent the Great Migration with a scene of departure. Why do you think he did this? Why might he tell us about leaving the South rather than arriving in the North? How does Walter Ellison use repeated colors or shapes to tell the story in this image? How is this scene similar to or different from what you might see in a public place, like a train station, a bus stop, or an airport, today? Choose one character in Train Station and create a diary entry describing that person’s journey. Give the character a name, describe what he/she chose to wear and why, describe what is in his/her suitcase or bag, who he/she is traveling with, where he/she is going, why he/she left home, the train trip itself, etc. If possible, reference specific details from the painting. Using individual world maps, locate where your family or ancestors came from. On the map, trace the path of your family’s migration to Chicago. Interview a member of your family (or someone you know) who came to Chicago from somewhere else. How old was he/she when he/she arrived? Who did he/she come with? Why did he/she move here? Did his/her movement to Chicago involve crossing a border? What aspects of Chicago were drew him/her to the city? Answer some of these answers yourself and compare them to those of your family member. Optional: Create an illustration of a certain part of your family member’s journey. Or, create a photo collage describing his/her journey. Lawrence, Jacob. The Great Migration: An American Story. New York: Harper Collins, 1995. 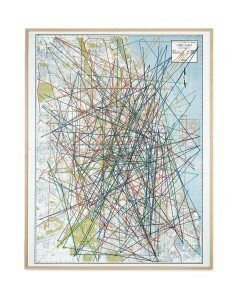 “Train Station” by Walter Ellison, Artwork Resource Packet (Chicago: The Art Institute of Chicago, 2003). African American Art at The Art Institute of Chicago, Teacher Manual (Chicago: The Art Institute of Chicago, 1997). Grossman, James R., Land of Hope: Chicago, Black Southerners, and the Great Migration. Chicago: The University of Chicago Press, 1989. Wilkerson, Isabel, The Warmth of Other Suns: The Epic Story of America’s Great Migration. New York: Random House, 2010.